Intel’s revisionism in major publications is an important issue that was covered here several months ago, just after the company had sabotaged a charitable project. Intel would deny involvement or claim to have done so in self defense, but keeping one’s price-fixing schemes in tact is no excuse. Moreover, there are human victims at play. 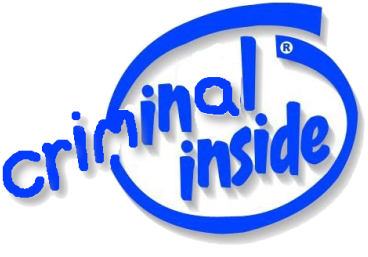 “…[K]eeping one’s price-fixing schemes in tact is no excuse.”Intel’s crimes, however, are better characterised using the Vista collusion, which is the most recent and thus freshest example of a pattern that went on for many years. Intel’s long history of misconduct can be found in the literature. It is not deniable that Intel bribed companies like Dell in order for them not to stock the competitors’ products. This is similar to what Microsoft was doing illegally. It ended up in court for it. About a year ago, Intel attempted to exempt itself by dismissing its resistors in Europe as “anti-American”. It’s a bit like the “Microsoft hater” label, which is a cheap attempt at discrediting legitimate critics using derogatory labels [1-8]. As we mentioned briefly a couple of days ago, Intel had the chutzpah to not only wiggle its way out of punishment for the crimes it had committed but also to demand reimbursement. According (PDF) to the Official Journal of the European Union, Intel wants the EC to pay for all its court costs, extend the filing deadline to 30 days after Intel receives certain documents it’s seeking, and annul two previous decisions in the case. Santa Clara claims that its ability to defend itself has been weakened by the EC’s refusal to grant it access to certain documents AMD has filed as evidence in the case. It argues that the Commission’s Hearing Officer (roughly analogous to a judge) acted improperly when he ruled that Intel did not need access to these documents in order to mount a vigorous defense. This optimistic (almost euphoric) viewpoint from Intel completely neglects the severity of the evidence at hand. Intel has been resorting to delaying tactics and was missing many deadlines recently, thus showing nothing but contempt for the process — one that’s akin to another company that comes from Redmond, Washington. Although this post is clearly unrelated to the primary subject of the Web site, it was seen as important by some readers that awareness of Intel is increased. Intel exploits nasty tactics in attempt to achieve a monopoly in audio cards, storage (SSD), graphics cards, processors, motherboards, network cards, USB, and so forth. So-called “Netbooks” are a good example. In the process, Intel not only attacks AMD; using FUD, Intel recently slammed (publicly) Apple, ARM, and even NVIDIA, whose CEO was furious. The industry needs more competition and less bullies.